Being mindful of where you park your vehicle and of its contents can go a long way in discouraging thieves. Here are a few, simple things you can do to secure your vehicle. Thieves like easy targets and no witnesses to the crime. Parking in a well-lit, highly visible area is only one piece of the equation. It takes just a few seconds to smash a window, grab a purse and leave the scene. Park in areas of heavy foot traffic. It is the combination of potential witnesses and high-visibility that discourages thieves. Don’t invite trouble. Always secure your vehicle by keeping it locked, even it is parked in your driveway. Get in the habit of locking your vehicle every time you exit it with no exceptions. Remember, it just takes letting your guard down once to become a victim. Three things must be present for a crime to occur: desire, ability and opportunity. We have no control over the desire or ability of criminals. However, we can take away their opportunity. Leave nothing visible in your vehicle. When looking through the window of your vehicle no contents should be visible regardless of their value. Criminals don’t the know the value of what is inside a bag until they smash a window and see for themselves. 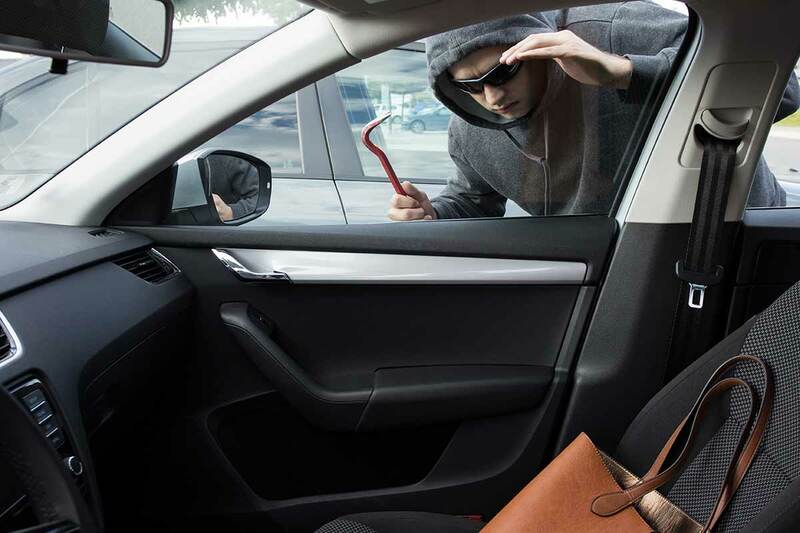 We’ve all seen people get out of their vehicle, lock valuables in their trunk and go about their business. If a criminal sees this you run the risk of returning to a vehicle with a smashed window and a popped trunk with your valuables gone. Securing your valuables in your trunk should be done while no one is watching. Do not advertise what may be in your vehicle. Some of the most sought after items in vehicle break-ins are guns and tools. You may be a proud supporter of the 2nd amendment but resist the temptation to put hunting and pro-gun stickers on your vehicle. I think you will find that securing your vehicle is pretty easy. Be consistent and don’t let your guard down. Remember, we are only one instance of complacency away from being victims.